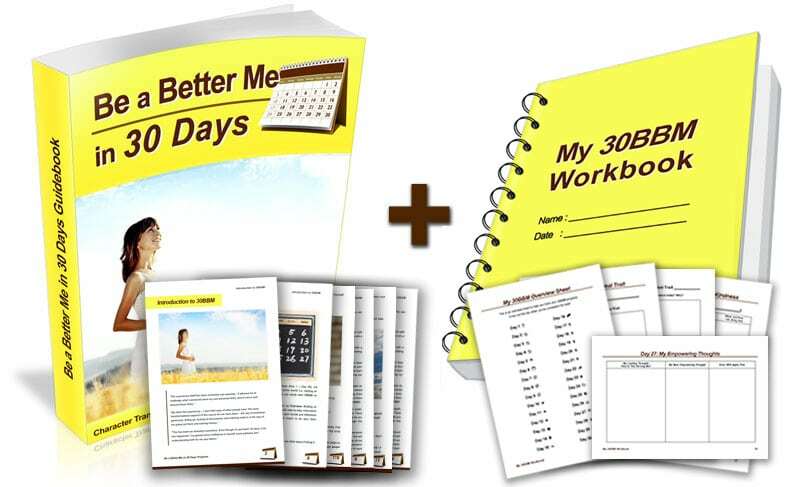 Ready to Be a Better You in Just 30 Days? “ The whole experience was far beyond my expectations, and I was expecting a lot. I have made huge strides in overcoming my negative traits. “ Amazing. Even though it’s just been 30 days, a lot has happened. I've gained more confidence, patience, and understanding for myself and others. 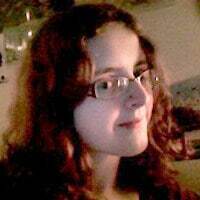 “ I have gained invaluable insight into how I work as a person. Even better, I’ve experienced first hand how I can turn things around. The 'Discover Your Ideal Self' task was monumental. “ …The best part was when two separate family members, who had no idea I was doing 30BBM, commented how much I have changed. That they noticed a change proves that 30BBM really works. Hi! I’m Celestine Chua, the founder of Personal Excellence and creator of Be a Better Me in 30 Days Program. 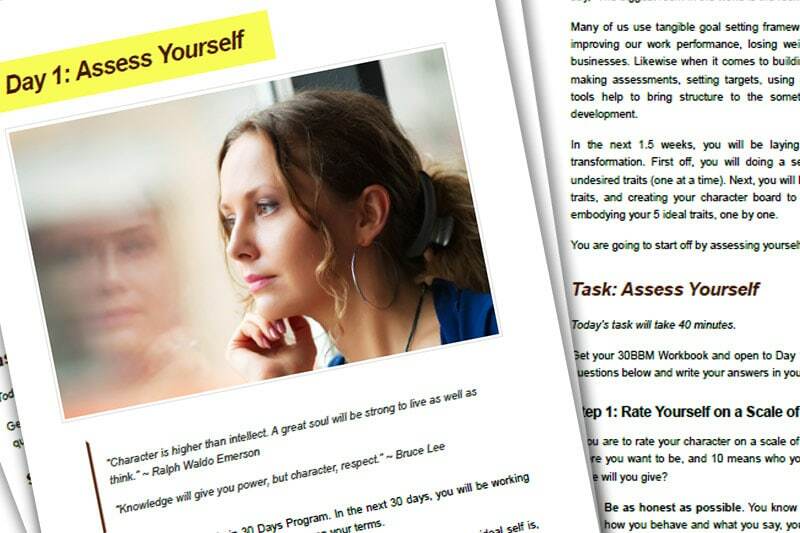 This is my 30-day self-coaching program to discover your inner self. Read on! 30 Days. 30 Tasks to Be a Better You. 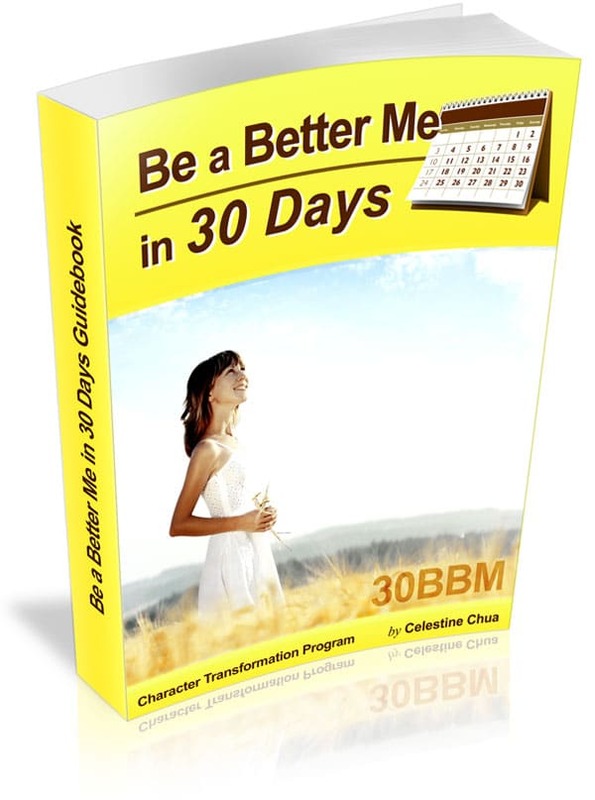 Be a Better Me in 30 Days™ (or 30BBM in short) is an intensive character transformation program to be a better YOU in just 30 days. It is packed with 30 high impact tasks to be done one per day, and will push you to be a better person by the end of the month! 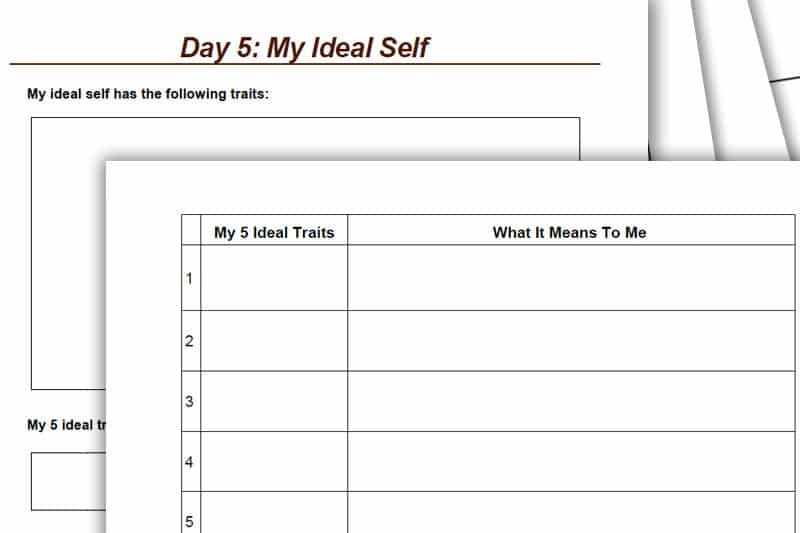 In Week 1, you’ll be doing an honest self-assessment, weeding out negative traits, and discovering your ideal self. In Week 2, you’ll be embodying your ideal traits and upholding important virtues like emotional generosity and kindness, and self-love. In Week 3, you’ll be improving yourself in your roles to others, getting feedback to improve yourself, seeking advice from others, reflecting on criticism, and more. … among many other tasks designed to transform your character and be a better you! Past participants have found themselves more positive, happier, patient, confident, empathetic, productive, and disciplined as soon as Week 1 of the program. The tasks are not about changing you to be someone else, but about being a better YOU — by your definition. Like 30DLBL, 30BBM has unlimited re-do value — I have designed all the tasks to be timeless. This means you can do 30BBM again and again and learn something new each time. Don’t just hear it from me though — read what past participants have to say below. “ Celes, I just want to say that the simple methods you offer in 30BBM have been transformative for me, and I’m in my 50s. People are seeing more change faster than I can imagine. – Carlene Byron, Maine, U.S.
308-page Comprehensive Guidebook that will guide you through 30BBM, every step of the way (the book on the left). This is in PDF format. Timeless Tasks you can do again and again every year, with new results each time! Powerful system to transform your character and become your highest self! “ Fantastic, amazing, wonderful. I have gained a lot in less time than I could have imagined. The biggest things I feel are great are (1) that we explore different aspects of ourselves and ask why this/that is not good for us, and (2) how we let go of things that have been a burden and affecting our lives. I know for a fact that my vulnerabilities were hindering my progress in several things, but once they were released… things have improved dramatically. You recognize that most of our problems in life are a reflection of ourselves. By starting with our inner selves, we gain the right tools and mindsets to deal with most of life's struggles and create our best lives. The cover art for the guidebook. 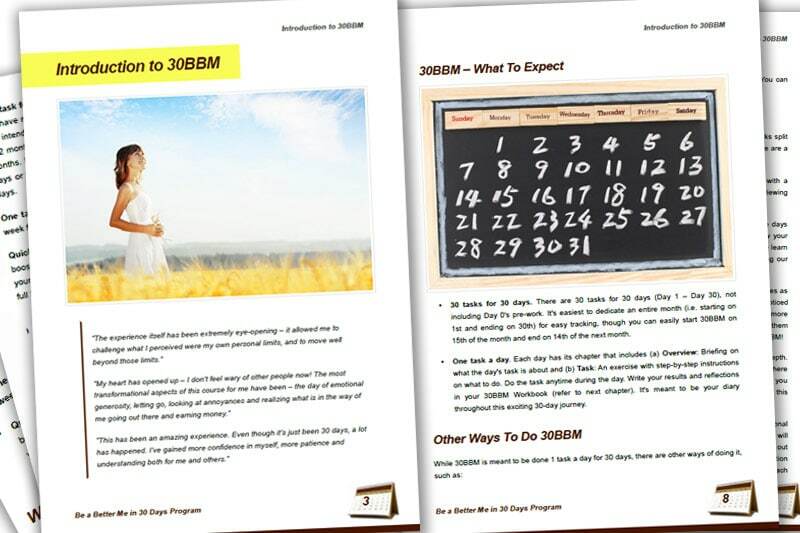 Like 30DLBL Program, you will get a 308-page comprehensive 30BBM Guidebook that will guide you through your 30BBM journey. 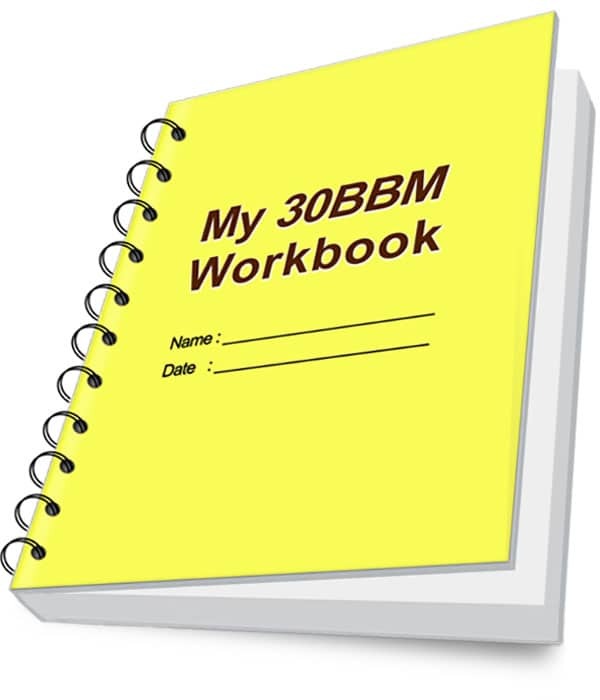 This is your 30BBM Workbook with templates for every day’s task (where applicable). This is a separate book on top of your 30BBM guidebook. Inside, you’ll find detailed templates for all of the 30 days’ tasks and daily reflection logs to jot down your findings and thoughts. A sneak peek of the guidebook. This is the introduction where you will find the briefing for your 30-day character transformation journey ahead. Overview sheet in the Workbook to keep track of your 30BBM tasks. How do you rate yourself as a person? 30BBM starts off with a self-assessment. Taking a hard look at yourself, rating the present-day you vs. your ideal self, and identifying the areas to work on. 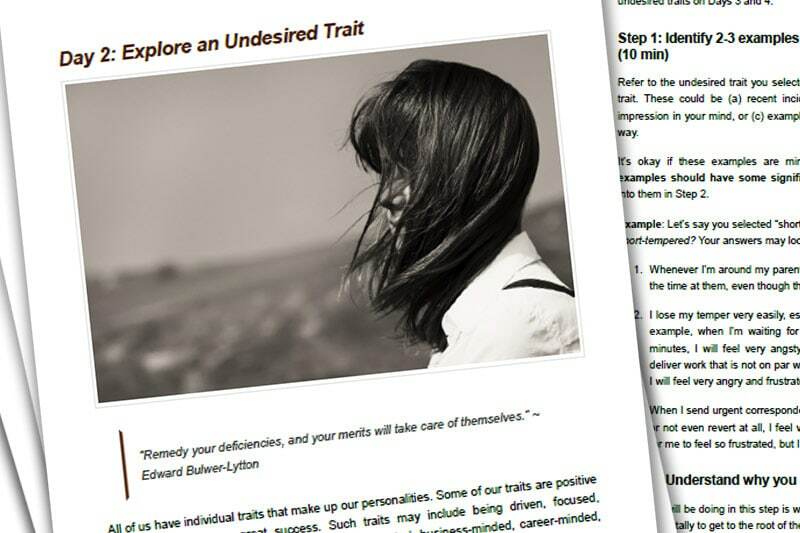 On Days 2-4, you will do a deep exploration of your undesired traits. Think of it as a mental surgery where you purge out unwanted impurities in your consciousness to make way for the new you. What is your ideal self like? 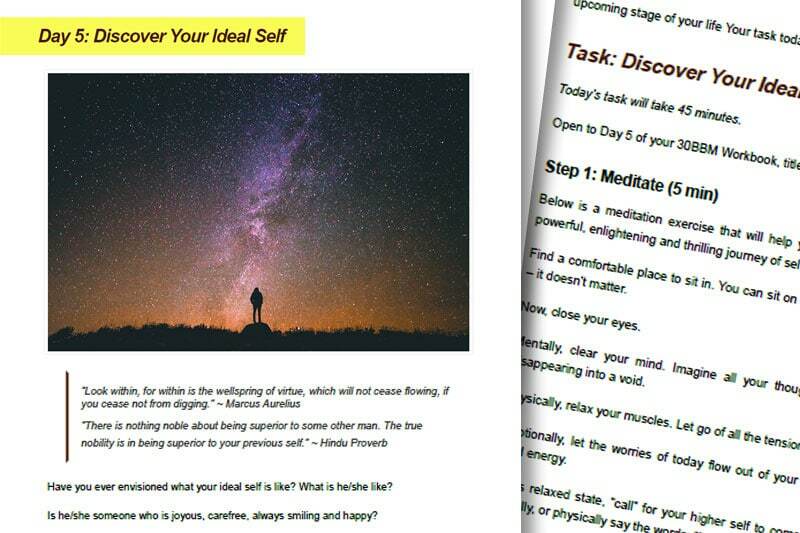 In Day 5, you will be uncovering your ideal self, via connecting with your higher self through a beautiful meditation and deep visualization exercise. This image of your ideal self will essentially be the person you are to grow into as you enter your next phase in life. Workbook template for Day 5. After you “meet” your ideal self, you will select 5 ideal traits that represent him/her. This is the person you will grow into in the next few months! 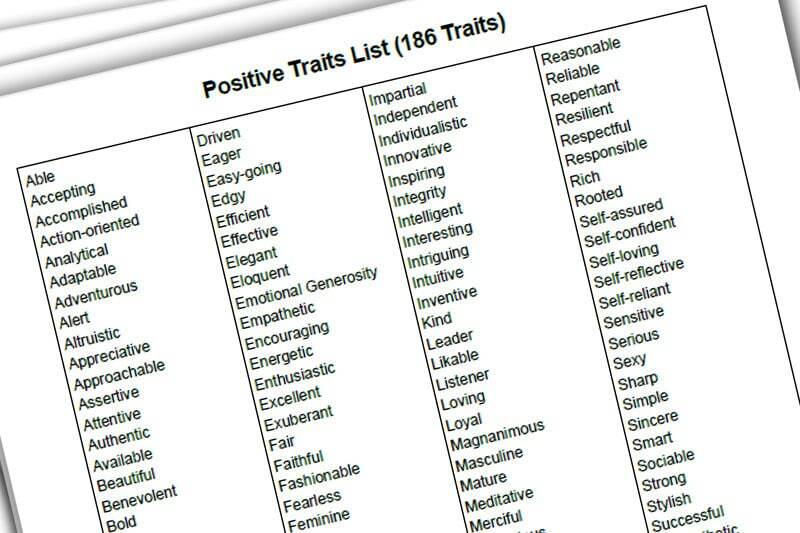 Positive traits list of positive traits you can take on for your ideal self. There is no end to who we can grow into! 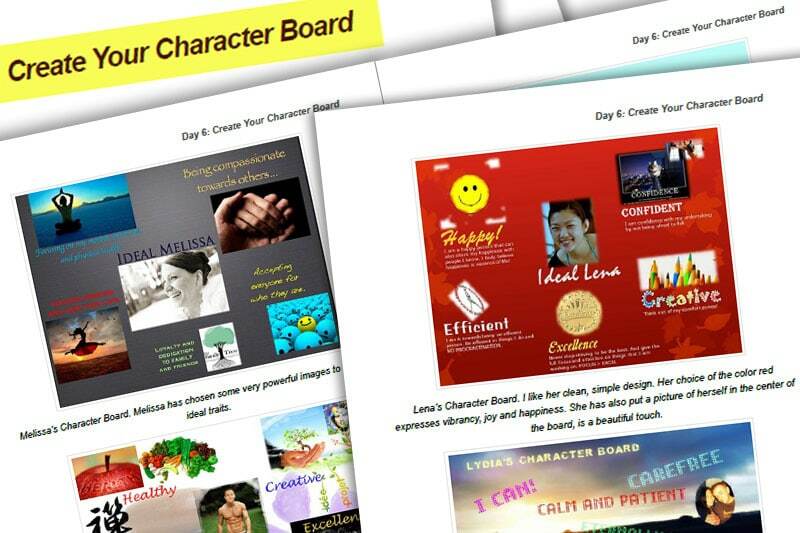 Creating your character board is an all-time favorite task among 30BBM participants! Create a physical (or digital) board to celebrate your ideal self! 30BBM is a holistic program of theory, planning, and action-taking. 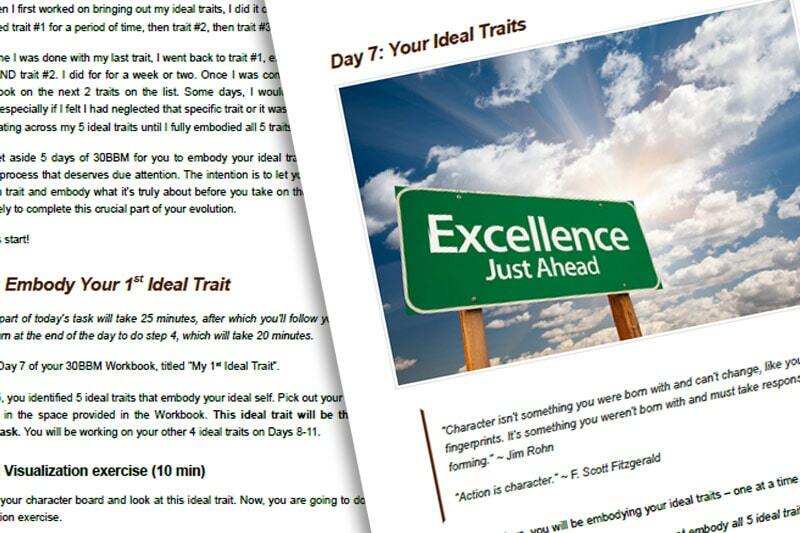 You will be embodying your 5 ideal traits in the 2nd week of the program! Appreciating others is important, and so is appreciating yourself. Do you give yourself credit for all the things you’ve done in life so far? 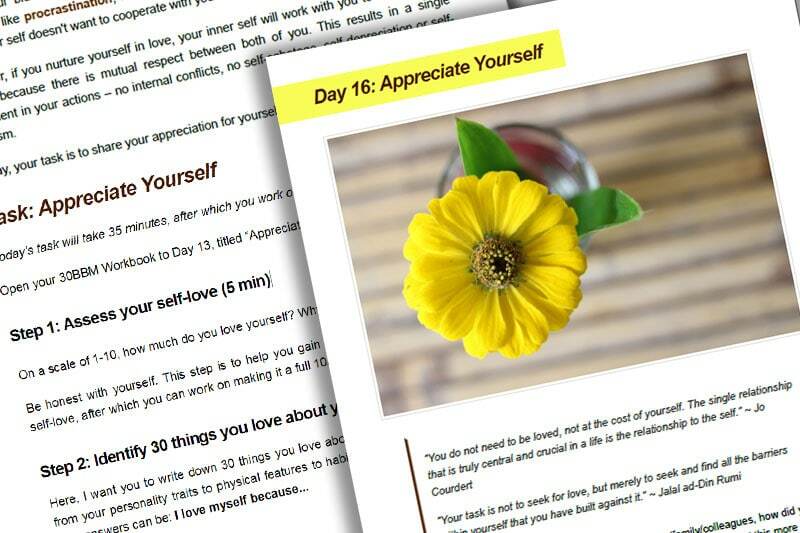 On Day 13, your task is to identify things you love about yourself —and then, to write a letter of appreciation to yourself. All of us play different roles to different people in our lives, and you are no different. On a scale of 1-10, how do you rate yourself in your 3 most important roles? You will be doing a detailed evaluation on Day 17, and then improve yourself in those roles on Days 18-20. All of us have shames and vulnerabilities. Acknowledging them is part of becoming a better you. On Day 23, you will acknowledge a shame/vulnerability that is locked up in you. Is there something in your past you have still not let go of? When one is unable to let go, it’s because he/she still feels anger or blame. You will look into that on Day 25. Being a better person requires you to constantly evaluate your thoughts and remove limiting beliefs. You will do this on Days 26-27. Do you sometimes get criticism you don’t like? Receiving criticisms is part and parcel of life. We should not try to deflect criticisms but learn from them. 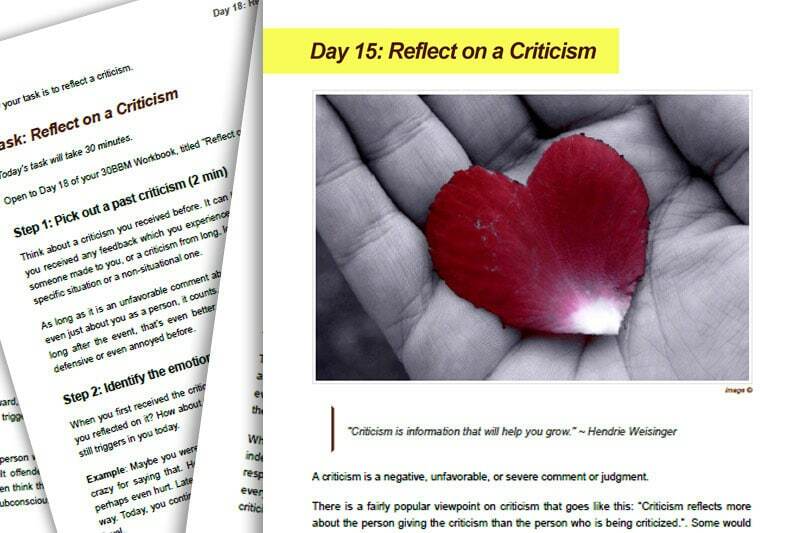 In one of the 30BBM tasks, you will reflect on a past criticism and use it to become a better person. 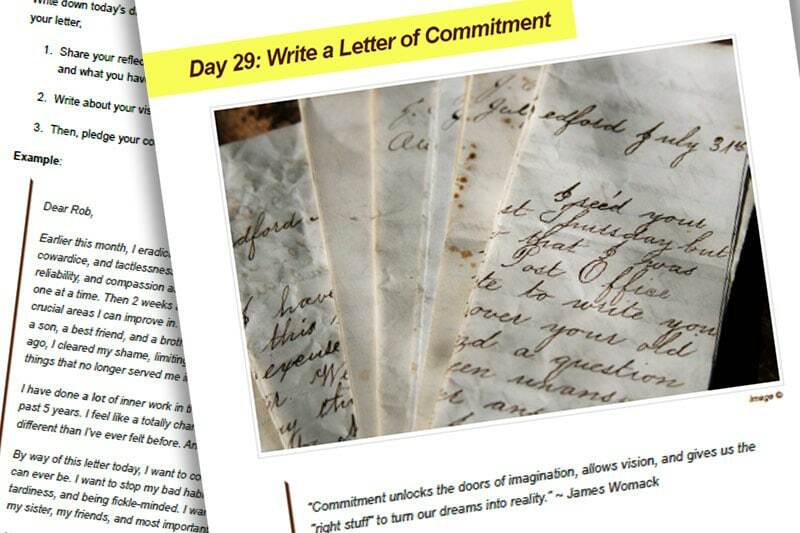 On Day 29, you will write a letter of commitment to yourself – to remind you of the person you want to grow into and to commit to your character growth. Be a Better You in just 30 days!! “ The 30BBM experience is amazing. Through 30BBM, I discovered my ideal self. I remembered that when we give happiness, happiness comes to us. To me, every task has its own benefits; every task is useful as it works on us on different levels. “This has been an amazing experience in many ways. Even though it’s just been 30 days, I feel that a lot has happened. And that is because the tasks really demanded action from us. I’ve definitely gained more confidence in myself, more patience and understanding both for me and others. I feel that many great insights have emerged and will continue to do so as I continue with 30BBM. It’s amazing to see that in just 30 days we CAN make a big difference in our lives if we choose to do so. “30BBM brought a lot of positive consequences for me, but I think the most important was the realization that personal growth is unstoppable and continues in every minute. I gained more courage to actively engage in relationships and got the boost for personal growth in general — I had to wipe the dust off myself! I’d say the most challenging (and the most rewarding) was the task of getting feedback from others. It made me dare to open up, approach, and ask others very important and sincere questions about me (and I’m a person who just dreads receiving criticism!). I decided to ask these questions about myself at the end of every year! A big thank you, Celes!!! “The whole experience was far beyond my expectations, and I was expecting a lot. As a teacher and small time leader, I take my hat off to you. From this program, (1) I have learned to use a lot of powerful tools and learned how to face my fears and overcome them. (2) Made huge strides in overcoming negative traits. It is truly amazing to see that I have begun to earnestly be organized, disciplined, focused, purposeful, and a better friend and family member. (3) I am truly striving toward my ideal self and embodying ideal traits. (4) The best of all — I have learned to transmit solid questions and needs rather than negative-nervous energy. AND, I do not see this as done. I am so looking forward to seeing myself step up the ladder and become a better me. “Fantastic, amazing, wonderful. I can say that I have gained a lot in less time than I could have imagined. The whole course revolves around great things for our gain and explores as many aspects as possible within a month. The biggest things I feel are great are (1) the fact that we explore different aspects of ourselves and ask why this/that is not good for us and (2) how we let go of things that have been a burden and affecting our lives. The tasks I found most beneficial are on appreciating yourself and acknowledging a vulnerability. I think it’s of extreme importance to love ourselves and give ourselves a pat on the back every now and then. Releasing vulnerabilities is an important step to move on and do better. I know for a fact that mine were hindering my progress in several things, but once they were released… things have improved dramatically. Thank you, you have helped me change for the best, and I am really happy to have been a part of this program. “Celes, I just want to say that the simple methods you offer in 30BBM have been transformative for me, and I’m in my 50s. This program allows people to self-reveal… for those of us who don’t like to let others see our problems, it is effective as long as we’re willing to admit our problems to ourselves. Best to you! You totally deserve all the success you are having and much more! “ The experience has been extremely eye-opening — it has allowed me to challenge my own personal limits, and to move well beyond those limits. 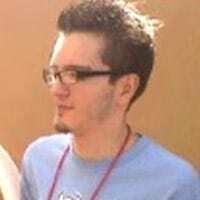 The best part was when two separate family members, who had no idea I was doing 30BBM, commented on how much I have changed over the last little while. The first noticed that I was much more talkative now and “had really come out of my shell”. The second commented on how assertive I have become, and how proud they were of me for it. Both were traits I was trying to overcome as part of 30BBM, as I have always been extremely shy, quiet and passive. The fact that they noticed a change proves that 30BBM has really worked for me. “I was taken by surprise at how hands on 30BBM is. I have gained invaluable insight into how I work as a person. Even better, I’ve experienced first hand how I can turn things around. I’ve basically learned a new way of being and I am going to commit myself to continuing on in a BBM way! One of the best things about 30BBM is that it gives you even doses of reflection and action. I’m used to self-help stuff being sort of like one big lecture – this is what you’re doing wrong, here’s that moment in your childhood that sealed your fate, etc and so on. 30BBM never lets you sit on your information which is great. It also challenges us to come up with our own action plans given what we have learned, which is genius I think. The ‘Discover Your Ideal Self’ task was monumental because I chose (my) ideal and I think it’s an absolute winner. So, instead of just seeing an awesome TED talk and thinking, Gosh, how do I do that? !, I got to work on it for myself. The opportunity? Priceless. “Through 30BBM, I’ve been able to get closer to myself and have been able to get a better perspective towards my life… I’ve reached out more to people who matter a lot to me and have realized how pouring out your heart on paper sets you free. I had once shared a close bond with a friend back in my home country. 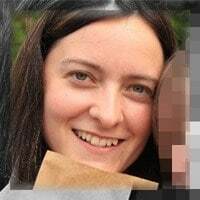 After marriage I left for some other country and had lost connection with her… but through one of the 30BBM tasks, seldom a week passes without me talking at least once to her. The days of appreciation hold a close place in my heart too as they both produced results where I’m simply more in love with myself and those around me. Every one of the tasks wove me into the magic that Celes has intended for us. Thank you. The barren depths of my life have been seeded into a serene colony of beautiful greens that will now color my life with the flowers of successful self-growth. “This has been a life-changing experience. I’ve learned that we can all make a difference if we just act, not tomorrow, not next week, not next month but TODAY. The biggest thing I feel is great about 30BBM is that it teaches us to view the world in unimaginable ways that we would never believe possible before. It shows us how to challenge ourselves, to never give up, to do what we can even if it comes out wrong. I benefited the most from the task on vulnerabilities because it was a hugely liberating task. Also the task on character board because I can stare at it each morning and remember what I want. There are also the appreciation days that allowed us to speak the feelings we’ve been harboring for some time to a special somebody. Thank you Celes for this wonderful experience. “ I can confirm that the 30BBM is definitely a very powerful program. 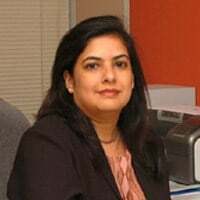 As an alumni of both 30DLBL and 30BBM, the insights I had and the changes brought about by doing 30BBM have made my 30DLBL experience even better the second time round. Is 30BBM a physical or a digital product? 30BBM is a digital product. The course is administered in the form of a digital guidebook and a digital workbook that you can print. The workbook comes in an additional .DOC format if you prefer to type your answers on the computer. You will get access to an online portal where you can download the files. If you prefer, you can also read the task instructions via the portal, where the daily tasks will get unlocked every day from the date you sign up. Is there any coaching support? 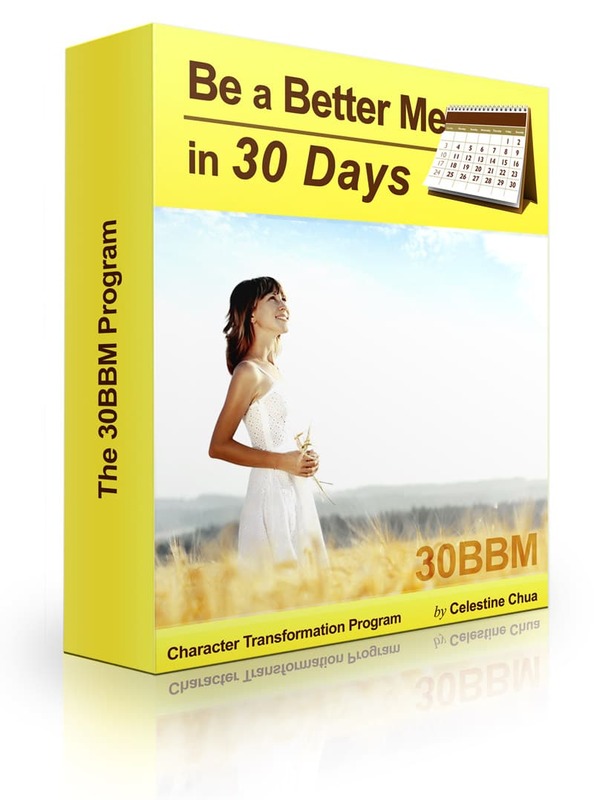 30BBM is a self-guided program to be done in your own space and time. Like 30DLBL, I created this as a self-coaching starter kit so that everyone can benefit from a structured life coaching experience without the steep costs of hiring a coach. There is no coaching support which is why the program can be priced at an affordable price. In comparison, my clients pay hundreds of dollars for a coaching session. What benefits will I get from doing 30BBM? Become a better person. If you are to rate yourself on a scale of 1-10, what score would you give yourself? No matter how good we are, there is always room to be better. Through 30BBM, you will work on becoming the 10/10 version of yourself. Weed out undesired traits. Do you have any traits you don’t like? For example: Procrastination. Laziness. Pessimism. Carelessness. Forgetfulness. Tardiness. Impatience. Low self-confidence. Abrasiveness. During 30BBM, you will explore your negative traits and weed them out one by one. Build new, desired traits. All of us have an ideal self that we want to be. What traits do you want to cultivate? Compassion? Assertiveness? Responsibility? Resilience? Courage? Self-Belief? Wisdom? Wittiness? Diligence? Through 30BBM, you will discover and embody your ideal traits. Discover yourself on a whole new level. Know why you behave the way you do. Understand the motivations behind your actions. Connect with your inner self. This is part of improving as a person. Cultivate timeless virtues. 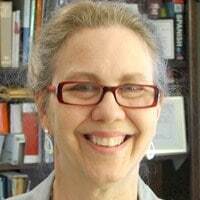 There are universal values that connect us as humans such as Compassion, Gratitude, Love, Kindness, Generosity, Forgiveness, Positivity, Growth. You will reacquaint with these virtues and practice them on others. Be a better person… to OTHERS. You live in a world where you play important roles to others, be it as a child, parent, employee, manager, friend, or partner. In 30BBM, you will work on improving yourself in your roles to others. Be connected with your inner world. 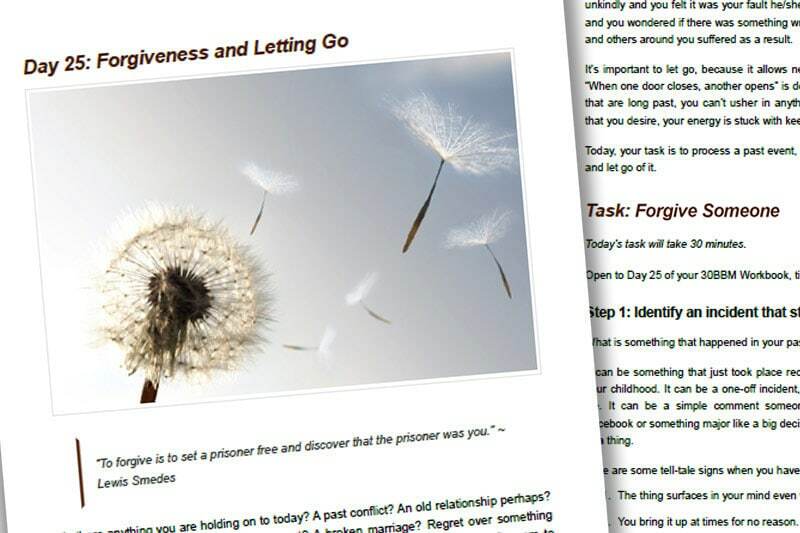 30BBM has many deep, provoking tasks that require you to connect DEEP within, such as working on your annoyances, addressing your shame, righting past wrongs and grievances. Addressing past baggage is part and parcel of personal growth. All of these are covered in 30BBM — and more. What's the difference with 30DLBL (Live a Better Life in 30 Days Program)? 30DLBL is Live a Better Life in 30 Days Program, a life transformation program. The programs are entirely different, covering different things. 30BBM is about working on your inner self and character, while 30DLBL is about your life and your goals. Like 30DLBL, 30BBM is designed to be action-focused so there are no big chunks of theory but concise information and specific action steps. More about 30BBM here. Is it enough for me to do just one program? 30DLBL and 30BBM are completely different programs, not meant to overlap in terms of themes and tasks. As mentioned in the previous answer, 30DLBL is about creating a better life (with tasks tackling your life) while 30BBM is creating a better you (with tasks tackling your character and inner self). Given that, I personally recommend getting both programs to get the best benefits, or at least doing one first, and then considering the other program down the road. Doing both programs will yield synergy and greater impact than just doing one. Does it matter if I haven't done 30DLBL yet? No, not at all! I have designed the programs to be completely standalone. You can do 30DLBL or 30BBM without doing the other first. Both programs complement each other and work well alone, while giving you the best results when you complete both. Which program should I do first? If you have no preference and you are looking something to jump start your life, I’d recommend 30DLBL first. It is the program that started it all and the very first course I launched at Personal Excellence. It tackles the core foundations of living a better life, so that when you dive deep into individual areas of self-development later on, you already have a solid base to build your results. On the other hand, if you are more interested on working on your character traits, becoming a better person, and just becoming a person you love, then 30BBM is the way to go. You can then do 30DLBL later! Whichever program you do first, it will be a transformational experience. 🙂 You can always start 30DLBL or 30BBM after finishing the other, so don’t feel that you need to deliberate 5 days just to make the decision. I rather you use this time to work on the tasks. The results will follow! Since 30BBM is in digital form, how do I edit the workbook? Since each program is meant to be timeless and can be done as many times as you want, you can create a new copy of the .doc workbook and specify the date whenever you’re doing a run — such as 30BBM_Workbook_Jun2017.doc if you’re doing it in June 2017, and subsequently 30BBM_Workbook_Dec2017 when you do it 6 months later. This way you can look back and review your progress through the months/years. How often should I do 30BBM? 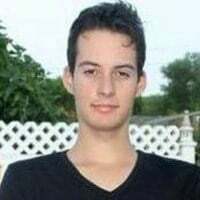 Like 30DLBL, 30BBM is designed to be a timeless program to be done again and again, with unique insights to be taken away each time. I recommend doing it once every 6 months to a year. While January, June, and December are great months to do the program, you can do it anytime you want. You can pick and do selected tasks for a quick boost anytime of the year in between your 30BBM runs, after you complete the program at least once (I mention this in the introduction chapter). Again, it’s more important to actually get started rather than for that “perfect” moment to do it, because the perfect moment is really now. As 30BBM is a digital product that you download right after purchase, there is no money-back policy. Being in the online space for 20 years, I’m here to deliver great quality products that will change your life. The testimonials on this page are by real users and give you an idea of what the program can offer. Additionally, here is a short preview which features 20 random pages of the guidebook. Do you have any special offer if I get both programs together? Yes! As 30BBM and 30DLBL are sister programs, I am offering a 15% discount if you get both programs together. This discount may be removed in the future. Scroll down to the bottom of the page to access the link. This offer is only valid if you purchase them together, not if you purchase them at different times. So if you purchase 30BBM now and then purchase 30DLBL later, the discount is not applicable. “ …The best part was when two separate family members, who had no idea I was doing 30BBM, commented on how much I have changed. The first noticed that I am much more talkative now and ‘have really come out of my shell.’ The second commented on how assertive I have become, and how proud they were of me for it. Both were traits I was trying to overcome as part of 30BBM, as I have always been extremely shy and passive. The fact that they noticed a change proves that 30BBM has really worked for me. Get Started in the Next Minute! 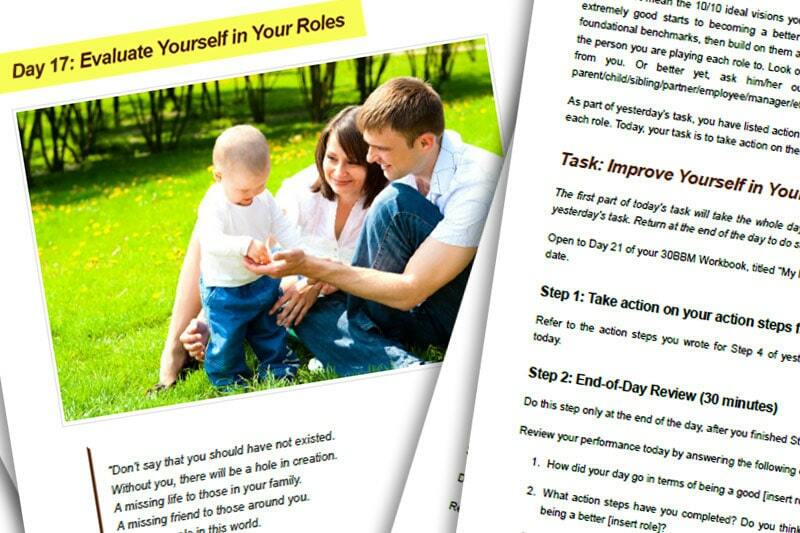 Be a Better You in just 30 Days with this in-depth self-coaching program! Bonus: Access to our members portal where you can access 30BBM wherever you are! The above, yours at only $39.95 USD. That’s only $1.33 per task, for a 30-day coaching system that will help you transform into your best self and change your life and relationships forever. The value of this program is easily worth hundreds of dollars. I’m offering it at only $39.95 USD because I want this to be the starting point of your growth. I have designed 30BBM to be the must-have, kickstarter program for anyone serious about character growth. This price may be changed and increased anytime in the future. Through this self-guided program, you’ll get access to some of the same powerful concepts and exercises that I use with my clients in our 1-1 coaching sessions, at only a small fraction of my coaching fee. Transform into the best you in the next 30 days! Download Now and Start the Program!